Find Lancaster, PA Electricians | Lancaster, PA Electrical Contractors | Lancaster, PA's Residential, Commercial, Industrial Electricians Directory. Find licensed electrical contractors in Lancaster County, PA for Residential, Commercial & Industrial projects here! Homeowners need electricians to install new modern circuit breaker electrical service panels replacing antiquated fuse panels. You may need extra outlets installed in an older home that didn't have electrical receptacles installed in every corner of the home. Perhaps you're installing ceiling fans and need them wired to switch panels on the walls. Or, you want to add a hot tub to your backyard and need electrical service installed. You'll find electricians available for all of these services and more here on lancaster electrical .com. Need an industrial or commercial electrician here in Lancaster County? Whether you need high bay lighting installed or a new three phase feed for that new high powered machine your adding commercial and industrial electricians have the skill set to make every installation and upgrade run smoothly. Read the latest news for licensed electrical contractors in Lancaster County, PA. There are many ways to measure solar power's growth in the United States. According to a recent study, much of it is happening in major metropolitan areas. In April, Environment America Research and Policy Center teamed up with the Frontier Group to publish the sixth annual Shining Cities report. The 2019 version surveys solar energy in America’s biggest cities. The study includes findings that reflect on the expansion of solar power in U.S. cities and how those cities are contributing to solar's rise in the country overall. According to the report, 70 percent of the 57 cities that have been surveyed in all six annual versions have more than doubled their solar capacity since the first report. One-third of those cities have more than quadrupled their capacity. The study notes that the United States now has over 60 gigawatts of solar photovoltaic capacity installed. That is enough to power one in every 11 homes in the country. As major population centers and concentrations of electricity demand, cities are at the center of that trend. With millions of rooftops in their jurisdictions they also have tremendous potential for installed capacity. Many cities in the report are designated as “Solar Stars” because they have installed over 50 watts of capacity per resident. The number of such cities has grown from eight to 23 in the six years since the first report. According to the report, Honolulu leads the nation’s cities for solar power per person. Los Angeles leads the nation for total solar capacity. However, solar power growth in cities is not just a west coast trend. The study finds “Solar Stars” in every region, including Las Vegas; Indianapolis; San Antonio; Washington, D.C.; and Burlington, Vt. Smaller cities are also jumping on the wagon. The study notes that Santa Fe, Calif.; Tallahassee, Fla.; and Trenton, N.J. have also earned the title of Solar Stars. According to recent testimony by U.S. Secretary of Labor Alexander Acosta, Occupational Safety and Health Administration (OSHA) workplace inspections will increase in the future. In 2017 and 2018, OSHA workplace inspections occurred at a rate of about 32,000 each year, an increase from the number of inspections in 2016. According to Secretary Acosta, OSHA has hired 76 new inspectors, and as soon as they complete their training, the number of inspections per year will increase even more. Secretary Acosta anticipates their training will be completed in anywhere from one to three years, depending on their prior experience and the complexity of the inspections they may carry out. Discussing the recent increase in inspections, Secretary Acosta said, "These numbers are impressive, particularly given that OSHA dedicated substantial resources in fiscal year 2018 to hiring and training new inspectors. In August 2017, OSHA was provided blanket approval to hire needed inspectors to carry out its important work. The result was the hiring of 76 new inspectors in fiscal year 2018." In the 2018 fiscal year, in addition to its 32,000 inspections, OSHA personnel made 26,362 compliance assistance visits, covering more than 970,000 workers, and identifying and correcting 135,021 hazards. "During this time, these new hires do not generally conduct independent inspections," he added. "OSHA has been hard at work to onboard and train new inspectors and expects to have a significant increase in inspectors in fiscal year 2019." Secretary Acosta believes the increase in the number of inspectors and inspections is warranted. "Even as employment substantially increased and less-experienced workers were onboarded, the numbers and rates of fatal injuries and nonfatal injuries and illnesses in the workplace declined," he said. "With 43 fewer workplace fatalities in 2017, reversing a three-year upward trend, the fatality rate fell to 3.5 per 100,000 full-time equivalent workers." He added that this decrease occurred in spite of the increase in fatalities due to overdoses from non-medical use of drugs or alcohol, which increased from 217 to 272 nationwide in 2017. Acosta gave his testimony to the House Labor, Health and Human Services, Education and Related Agencies Appropriations Subcommittee on Apr. 3, 2019. Most experts agree, were it not for a plethora of federal, state and local financial incentives in recent years, including tax credits and rebates, U.S. solar energy would not be nearly as large as it is. Last week, a bipartisan group of U.S. senators and representatives decided electric vehicles (EVs) should benefit from the same treatment. On April 9, Sen. Debbie Stabenow (D-Mich.), Sen. Gary Peters (D-Mich.), Sen. Lamar Alexander (R-Tenn.), Sen. Susan Collins (R-Maine), and Rep. Dan Kildee (D-Mich.), introduced S.1094, the "Driving America Forward Act." If the bill becomes law, the result could be as beneficial to electrical contractors who are involved in the instillation of EV charging stations and infrastructure as the growing demand for solar has been to contractors who have been involved in solar power installations. According to the sponsors, the current $7,500 EV tax credit, which allows taxpayers to deduct part of an EV purchase cost, phases out over 15 months once an automaker reaches 200,000 cumulative EV sales. For example, Tesla saw the tax credit for the sale of its EVs reduced to $3,750 on Jan. 1, 2019, and General Motors saw the tax credit for the sale of its EVs reduced to $3,750 on Apr. 1, 2019. Tesla estimates its credit will fall to $1,875 in July and expire by the end of 2019. GM expects its credit will fall to $1,875 in October and expire by April 2020. The new bill is designed to provide each EV automaker with a $7,000 tax credit for an additional 400,000 vehicles on top of the existing 200,000 vehicles that are eligible for the current $7,500 tax credit. Numerous automakers and environmental groups, including the Sierra Club, support the bill. In an April 10 statement from the Alliance of Automobile Manufacturers, Dave Schwietert, interim president and CEO, stated, "This bipartisan bill will help drive deployment and consumer acceptance of these energy-efficient, alternative powertrains. Automakers are investing substantially in electric vehicles, with 58 models on sale and more coming, but overall sales remain low." And, as noted earlier, if the bill becomes law, it will be good news for a number of electrical contractors, in that the demand for charging infrastructure, along the nation's highways, in communities, in business complexes, and in residential settings, will continue to grow. Turning seemingly far flung ideas into new energy resources with great mainstream potential has been a hallmark of the renewable revolution. In the spirit of that tradition, as offshore wind gains its own foothold in the power industry, another form of offshore renewable generation is also getting its share of attention. According to recent data, floating solar panels have the potential to power up a significant proportion of the nation’s energy output. Findings from the National Renewable Energy Laboratory (NREL) were published in a paper titled, “Floating PV: Assessing the Technical Potential of Photovoltaic Systems on Man-Made Water Bodies in the Continental U.S.," which appeared in the journal Environmental Science & Technology last December. According to NREL researchers, so-called "flotovoltaics" are a rapidly emerging generation technology. Panels that are situated directly on the water, as opposed to erected on the ground or on building rooftops, pose many benefits. By providing artificial shade, they can reduce evaporation and algae growth. They also reduce the operating temperature of solar panels, making them more efficient and cost-effective. In the paper, the scientists project that, if flotovoltaics were installed on the more than 24,000 man-made U.S. reservoirs, which represents about 27 percent of the identified suitable water bodies, the panels could generate up to 10 percent of the nation’s electricity output. Recognizing the opportunities presented by the rapidly decreasing price of solar in general, the scientists expect the technology to take off in the United States. The study’s authors note that the technology could prove particularly useful in areas where suitable land supply for traditional solar cells is restricted. They expect growth to occur “especially in areas that are land-constrained and where there’s a major conflict between solar encroaching on farmland.” The scientists also project that about 2.1 million hectares of land could be saved if solar panels were installed on bodies of water instead of on the ground. Modern technologies and equipment have found their way into many electrical installations and systems. It seems like the biggest evolution is occurring in lighting, and it brings many benefits with it. Having installed a swimming pool recently, I witnessed this evolution first-hand. The in-ground pool design included the latest cleaning system, new LED lighting, a variable-speed pump motor, and interconnection to smart-home Wi-Fi systems. This article reviews the National Electrical Code (NEC) requirements that apply to underwater LED luminaires installed in swimming pools. NEC Article 680 includes the general rules for pools in Part I and specific requirements for permanently installed swimming pools in Part II. Section 680.20 clearly indicates permanently installed swimming pools must comply with Parts I and II of Article 680. Section 680.23 addresses underwater lighting for pools. The first requirements address whether ground-fault circuit-interrupter (GFCI) protection is required for the luminaire and associated circuit. Section 680.23(A)(8) clarifies the GFCI requirements for the luminaire circuit. The low-voltage luminaire is supplied through a listed low-voltage transformer that is either an isolation-winding type or one that includes a system of double insulation. GFCI protection is not required on the 12-volt (V) AC side of the transformer supplying the luminaire as long as the output does not exceed the low voltage contact limit as 680.2(1) defines. Section 680.23(A)(5) addresses underwater luminaire location and requires the luminaire be at least 4 inches below the normal water level and not more than 18 inches below the normal water level. As far as servicing the luminaire for maintenance or replacing lamps, Section 680.23(B)(6) addresses the minimum length of the cord. The rule indicates all wet niche luminaires must be removable from the pool. This is accomplished by equipping the luminaire with enough cord length to remove it from its niche underwater and lift it to the deck or other dry location without having to enter the water. Wet niche luminaire requirements are in 680.23(B), which addresses wiring for the luminaire that is installed in either a metallic forming shell or a nonmetallic forming shell. It also addresses the issue of installing an 8 AWG solid or stranded copper bonding conductor for metallic forming shells. The metallic forming shell must be bonded to the equipotential bonding grid covered in Section 680.26. The bonding connection within a metallic forming shell must be encapsulated in a listed potting compound to protect the connection from the deteriorating effects of pool water. The listed cord assembly with the wet niche luminaire must include an insulated copper equipment grounding conductor not smaller than 16 AWG. In this installation, new LED technology is being supplied by an isolation transformer having an output voltage below the low-voltage contact limit of 15V AC. In this particular installation, the use of a nonmetallic forming shell eliminates the need to bond the forming shell. Section 680.26(B)(5) relaxes the bonding requirement for listed equipment that does not require bonding, such as LED underwater luminaires with nonmetallic wet niche forming shells. 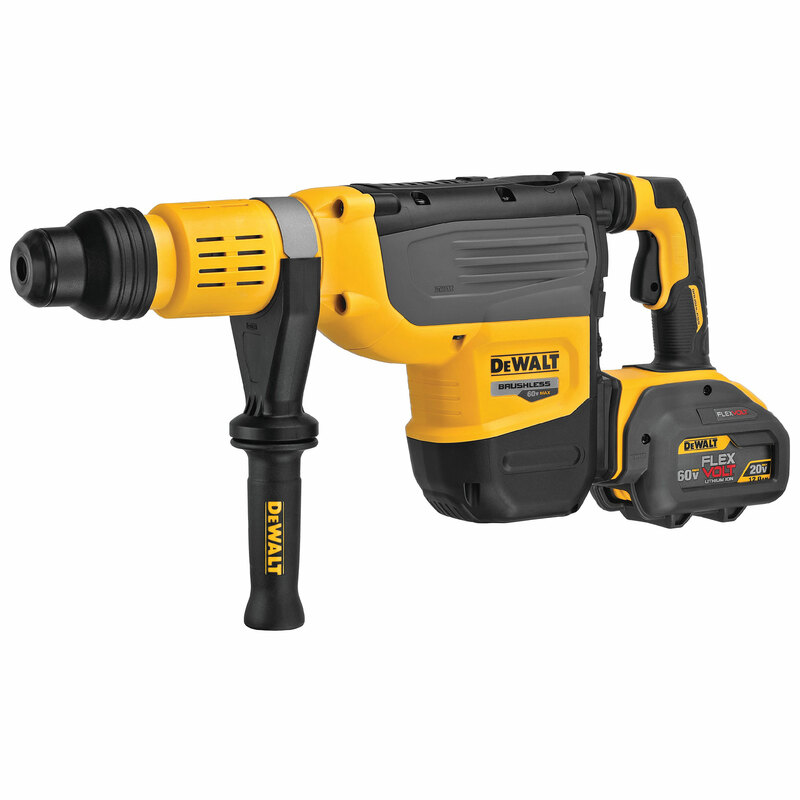 The electrical industry is evolving. 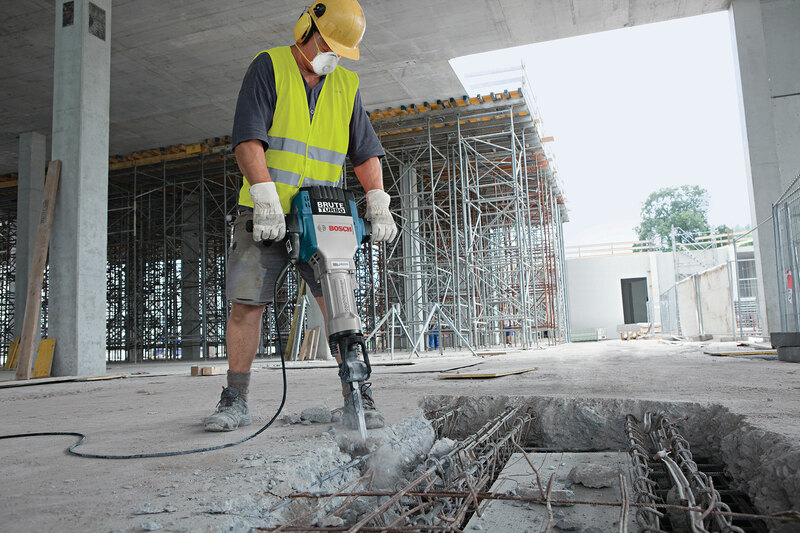 New equipment is developing quickly and is not only more efficient to install and maintain, but it also is often an increase in personnel safety. Employing new technologies for swimming pool installations is a definite safety enhancement in aquatic environments, such as when used in swimming pool applications. Decreasing voltage levels below the low-voltage contact limits through listed low-voltage transformers diminishes shock hazards and eliminates the requirement for installing GFCI protection, thus reducing expenses. Using nonmetallic forming shells with listed LED wet niche luminaires (as compared with traditional metallic forming shells) eliminates the requirement for bonding to the equipotential bonding grid; therefore, removing a bonding connection to a metallic forming shell and the bonding connection creates vulnerability to the deteriorating effects of pool water. Using variable-speed pool pump motors and controlling them through energy management systems and smart building technology reduces the expense of pool operation and maintenance. The internet of things relates to many types of electrical utilization equipment, appliances, electronics, and so forth that are all connected to and controlled through the internet in some way. Swimming pools are only one of many types of equipment and new technologies that are connected to it. In 2015, the Boston Consulting Group examined the LED lighting market and trends in its article, “How to Win in a Transforming Lighting Industry.” It stated, “The upheaval stems from two powerful shifts: the move toward light-emitting-diode (LED) lighting and the growing adoption of connected lighting systems. These trends, which reinforce one another, are fundamentally altering the underlying economics and dynamics of the market. The result: companies across the complex lighting ecosystem must evaluate where they can compete effectively amid the changes and adopt new strategies to win in the future.” They were upbeat then, and their prophecy seems to hold. The article outlined the salient benefits of LEDs: LED lighting is currently four to five times more energy-efficient than conventional technologies and is expected to become even more efficient—a critical edge, considering more than 50 percent of the total lighting cost stems from energy consumption; it is more versatile than other technologies, and it is available in a wider variety of colors. LED lamps also last about 15 years—nearly 10 times that of incandescents. According to the U.S. Department of Energy (DOE), outdoor area lighting is a major contributor to nationwide energy use, and the segment has been an important player in the transition to solid-state lighting. LED outdoor area luminaires have emerged as a popular choice that makes economic sense with many advantages. At the forefront of benefits, LED lighting provides the same lumen output for one-third of the power consumed by an high-pressure-sodium luminaires. In addition, LED outdoor area lighting provides better color rendering and visibility. With improved energy-efficiency, LED outdoor area lighting products with warmer color temperatures have become more popular because they reduce glare, light pollution, and the adverse health effects of nighttime lighting. As of late 2017, according to the DOE, roadway products alone made up 21 percent of their known LED lighting inventory database. But LED lighting is finding its way into parking lots, stadiums and other outdoor venues. The cost of LED products is declining, and its purchase cost is overcome with energy efficiency, handsome payback and other benefits such as brighter lights. Russ Sharer, vice president of global marketing for Fulham, a global leader in cost-efficient lighting solutions, said the future of LED lighting has several roadblocks, namely tariffs and compliance with UL and DesignLights Consortium (DLC) standards. In the long term, Sharer is concerned about compliance. There are many options in LED lighting technology—particularly for the outdoor market. The overall market, however, is not yet mature for this category. As the market fills out, contractors and designers will have even more choices. Prudence and care in design of LED lighting systems, as well as the same attention for selection and installation, should guide the EC into a well-lit world. Every jail, prison and correctional facility depends on technology to keep personnel, visitors and prisoners safe. The contractors and integrators that install or maintain those systems operate in a highly specialized niche. As jails evolve, manufacturers and ECs are adjusting to meet the latest challenges. Companies behind this technology like to partner with installers who understand the environment and its unique hurdles. With the permanence of concrete walls and an unpredictable population of inmates, installations need to be well-planned and highly robust, while flexible enough to be refurbished when needed. Contractors and integrators are designing and installing everything from perimeter management to wireless guard safety systems and smoke detectors. The work is done in a highly secure environment, and the system will be tested like in no other installation. On top of that, the systems are changing. The technology is better at identifying personnel locations and threats, such as drones, drugs and weapons. Each institution poses its own demands. The needs of a ­minimum-security facility differ from a maximum-security penitentiary; however, both require a system to track prisoner, guard and visitor safety. “Over the past 43 years, we’ve been involved in minimum, medium, maximum and administrative segregation correctional facilities, and the security requirements vary dramatically,” said Arthur Birch, president, ECSI International, Clifton, N.J., a provider of high-tech security solutions for these types of environments. Technology selection is important, and application is just as critical. If misapplied, even the best technology is ineffective. In minimum security facilities where inmates have more freedom to move around the campus, perimeter and access control require a robust surveillance system. Also, the housing units within those walls, such as dormitory-style and multiperson units, don’t demand the high security level that is applied to the individual cells of a maximum or administrative segregation security facility. Maximum security sites typically require a central command center where officers monitor the housing units, each containing approximately 50 individual cells. “A good security system can monitor each of those cells,” Birch said. It’s important to have a view into each cell, including the status of each door—whether it’s closed or open and whether the bolt is engaged. The latter is especially important because, if the door is closed but the bolt not thrown, the door could become a weapon used against an unsuspecting guard. Integration of life safety systems—including smoke detectors in return air ducts to identify potential fire hazard, as well as the cell security conditions—are monitored at the housing unit control room and in the central command and control center. It’s a far cry from days when officers kept constant watch of a monitor bank, displaying views from 24 or 36 cameras. After hours of watching those screens, inattention could lead to an incident going unnoticed. Today’s surveillance systems employ exception-based alarms. If motion is detected, an alert calls attention to a specific camera from the video wall. Outside, a typical facility has perimeter security on fences and walls as well as video for assessment and tracking. “[An illegal] action can be detected by the video system on a zone-by-zone basis,” Birch said. Often, a pan-tilt-zoom camera can assess and track the individual or incident until it is addressed or the individual is apprehended. That system is integrated with the intelligent video management system. Another recent point of concern is the sally port, the prison entrance where vehicles bring staff and inmates to the facility. Traditionally, each vehicle is checked for contraband or dangerous materials before entering. That often requires physical checks and mirrors to see under the vehicle. Today, undervehicle detection systems can assess the undercarriage and compare that image with the manufacturer’s photo. If a package is stored in the undercarriage, the software could identify it and alert the officer on-site. A newer threat is delivery of contraband by unmanned aerial vehicles (UAVs), i.e., drones. Drones offer inmates an opportunity to communicate with the outside world, and it is the job of the institution to observe and intercept that drone before any interaction takes place. Some facilities employ detection systems to spot a drone approaching the perimeter and even locate the individual flying that drone outside the facility. In most cases, facilities have to obtain approval to capture a drone and bring it down. Therefore, the best strategy has been to use radar to locate the drone’s launch point and apprehend the operator, rather than bring the drone down. Behind all of the technology, redundancy is crucial, Birch said. A security system requires a backup system. All of that should be supported by an uninterrupted power supply so systems continue to operate during power loss, which is critical. Since cabling will run through concrete walls and may need to be accessed or replaced decades later, it should be run through conduit and NEMA-standard enclosures. Early design and planning is paramount before construction begins. Once the concrete is poured, the system conduit and back boxes won’t be easy to install. Even nature threatens exposed wiring; for instance, the hum of the wire is a mating call for rodents. “We discovered this a long time ago and made sure that all cabling is in conduit,” Birch said. Most retrofits involve upgrading outdoor perimeter security because of wear and tear. Another area that often requires retrofits is the interior consoles. Founded in 1981, Ottawa’s Senstar Corp. sells perimeter ­intrusions-detection sensors and video management systems, which are deployed in correctional institutions around the world. “[Intrusion detection systems] are more precise in locating where an intrusion is taking place,” said Stewart Dewar, product manager, Senstar Corp. Early sensor systems could identify a potential security issue along a fence or wall perimeter within 100 meters; today, that accuracy can be within 3 meters (10 feet). Many Senstar systems use radar-type principles to locate the precise location of an intrusion. Another, more gradual evolution is the growing use of fiber optic cabling for perimeter defense, Dewar said. “Typically, you’ll find most [institutions] still use a specialized coaxial cable for detection,” Dewar said. However, Senstar has developed a cost-effective, fiber-optic- based system that, while still at a premium over coaxial-cable-based systems, is a better fit to available budgets. Fiber’s main advantage is that it’s impervious to lightning, Dewar said. That can be especially important in areas such as Florida or the Midwest, which frequently experience intense lightning storms. Fiber costs more, but in a growing number of cases, corrections facilities are willing to pay for that added security. “People appreciate a system that has zero probability of being damaged by lightning,” he said. Typically for system installation, Senstar goes to a third party. That’s where contractors have a role. Senstar normally partners with installers to get the system in place for customers. Those installers are often specialized in corrections work. Conducting on-site work requires more time than a typical installation does, and contractors need to account for that. Simply getting access to the work site takes time, the work needs to be scheduled around prison activity, and security escorts have to be arranged. It’s always nice to hear from my readers. In December 2018, I wrote about aerial fiber optic cables, and that column prompted a very interesting inquiry. Usually these inquiries are technical in nature and come from contractors, installers or sometimes from network owners and operators, but this was from a legislator in an Eastern state who had an unusual question. This legislator wanted to know if there were standards covering neatness for the installation of aerial fiber optic cables. He was particularly concerned with the large, messy coils of fiber optic cable left hanging on poles and cables in his area. 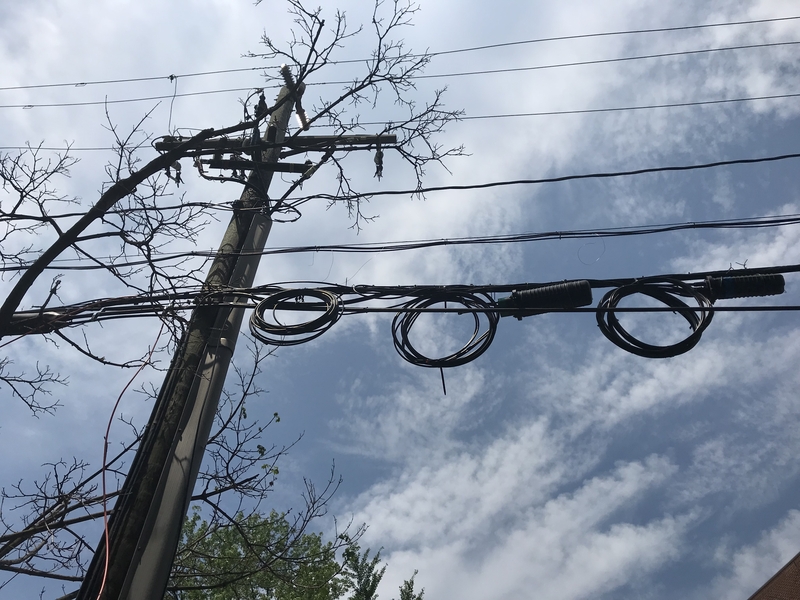 It was unsightly, and while aerial cables are particularly vulnerable in natural disasters, giant hanging coils of fiber on the cables seemed to make the situation worse. My response was simple: No, I do not know of any codes or standards on the installation of aerial cables that address installation neatness. 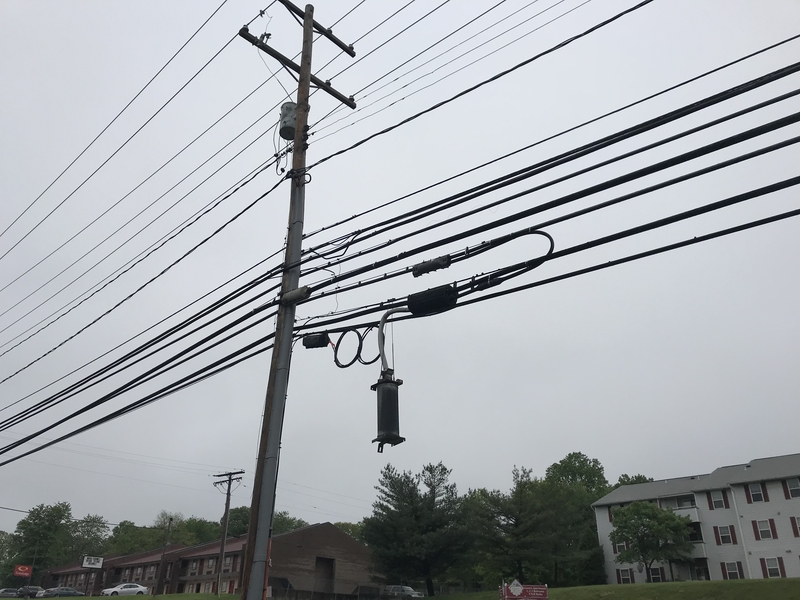 A few years ago, the Fiber Optics Association (FOA) ran a contest in its monthly newsletter, challenging readers around the world to send in photos of the worst aerial cable installations they could find. The winner was Cebu City in the Philippines. 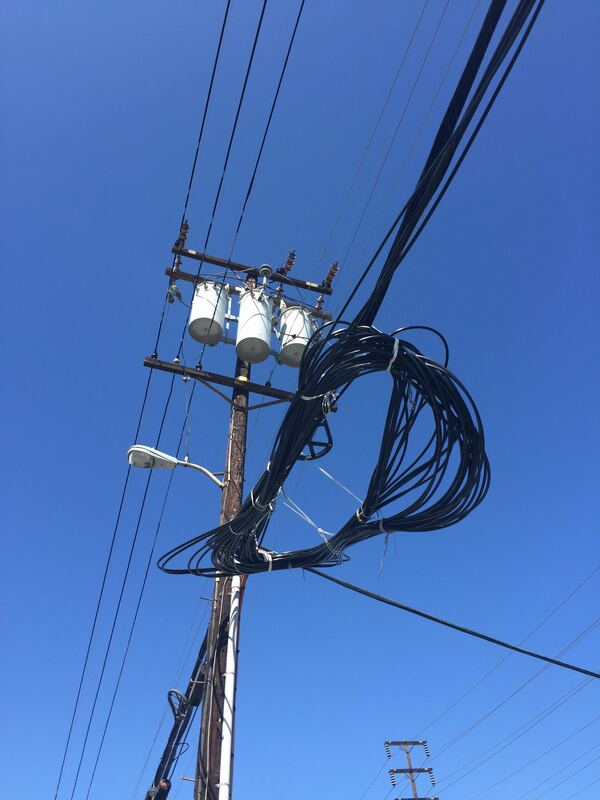 Granted, that photo was a mess, but it’s not that much worse than the pole at the end of the alley behind our building in Santa Monica, Calif.
On the lower messenger wire, I think at least 10 cables are lashed together. Above that is another messenger with a couple more. Around one pole, three fiber closures are lashed to cables and one closure, which I’m fairly sure is copper. Recently, several service loops were hanging off of those cables. Down the street, sitting next to a pedestal is a nitrogen cylinder used to pressurize old copper cable. I have not seen one of those in decades. I also took photos of a coil of maybe 100 meters of cable hanging on a cable right in front of the CATV provider office here in Santa Monica. In semi-rural California, I found what appeared to be close to a kilometer of cable hanging on a pole at the end of a road, ready to be run when the road was finished. California is not the only place I’ve seen these messes. On a trip to Maryland last year, I saw a copper splice closure hanging down several feet from the cables. But nothing beats the photo here that I took of a pole across from a friend’s house in a Boston suburb. On the pole, installers had run new cables after Hurricane Sandy and left not a loop of cable but a large wooden spool of cable hanging from the pole! In my December column, I also wrote the Federal Communications Commission’s new one-touch-make-ready rule allows contractors installing new cables to do all the work themselves. That means the pole owner, whom I assume has some interest in keeping the pole safe and neat, may not have any control over what happens to that pole when new cables are installed. Aerial cabling seems to get no respect. Nobody likes poles in their neighborhood, and many areas are burying cable. New developments almost always require underground cables. A lot of effort has been expended to create new installation methods that are less disruptive, like microtrenching. Rules such as “Dig Once” ensure whoever digs up a street installs ducts for future cable installs to prevent continually digging up the streets. However, there are simple ways to make aerial cables neater. If it is necessary to leave long service loops, plastic gadgets usually called “snowshoes” or “banjos” enable one to store long lengths of cable neatly lashed to the bundle of cables. That phrase was used a lot when the FOA partnered with NECA to create the NECA/FOA-301 fiber optic installation standard two decades ago, and I use it often today. Also, we all know, when we look at the workmanship of a cabling (or electrical) installation, if it’s neat, it’s probably done right. Ask around where you live to see if your city or state has any requirements for aerial telecom cable installation (not electrical), and let me know. When I discuss a fire alarm system with a contractor in the field, they always state their system installation complies with NFPA 72 2019, National Fire Alarm and Signaling Code. So, when I ask which chapter in the code they used, they often say the one that applies to buildings. First, all chapters except Chapter 29, Single- and Multiple-Station Alarms and Household Signaling Systems, apply to commercial fire alarm systems installations. That said, if you were not connecting the building system to a supervising station, Chapter 26, Supervising Station Alarm Systems, would not apply. The chapter the contractor referred to is Chapter 23, Protected Premises Alarm and Signaling Systems. The systems that Chapter 23 covers are for life safety, property protection or both. This is also the location of the requirements for all software-driven fire alarm systems. There appears to be some misinformation regarding software use, but the code is clear from the beginning of an installation. A record of installed software and firmware version numbers must be prepared and maintained in accordance with Chapter 7, Documentation. Software and firmware (nonchangeable in the field) within the system that interfaces to other required software or firmware must be functionally compatible. Compatibility between software systems is necessary to ensure the systems can communicate correctly and the overall system can function as intended. Unfortunately, even software that is compatible can become incompatible when updated. Newer software revisions might not maintain compatibility with older revisions, so it is important to test system operation when the software is changed in any way. The amount of testing Chapter 14 requires will depend on the extent the software was changed and what was affected. Additionally, compatibility between systems will be documented in one or the other (or both) of the manufacturer’s installation documents for the compatible products and controlled by the listings agencies. This documentation will be referenced in the product’s marking. The compatible software or firmware versions must be documented at the initial acceptance test and at any reacceptance tests. The documentation is allowed to be paper copy or electronic media. When a software revision changes, the documentation can be consulted to ensure it is still compatible with the software or firmware on the other side of the interface or that the components installed all work properly with the new software. There is a new section in the 2019 edition of Chapter 23 that allows separate fire alarm, carbon monoxide or other life safety systems if they do not send conflicting signals to the occupants or the actuation of any safety function. Keeping in mind that the code is not a design guide, fire alarm systems serving a building must include one or more of the following: manual fire alarm signal initiation, automatic fire alarm and supervisory signal initiation, monitoring of abnormal conditions in fire suppression systems, actuation of fire suppression systems, actuation of emergency control functions, and actuation of fire alarm notification appliances. Also, the system design, including all of its operating features, must be documented. All of the above are the minimum requirements for a fire alarm system installation in a new building. The design features of a required fire alarm system installation must be based on other applicable codes or statutes the enforcing jurisdiction has adopted. The code recognizes that owners may wish to install a fire alarm system in their building even when the codes in the jurisdiction do not require them to do so. In these cases, the system designer must establish the goals and objectives with the owner but must still meet NFPA 72 2019 requirements. The fact that the building or life safety code does not require a system doesn’t mean you can install whatever you want without following the code. Although the contractor at the beginning of this column was on the right track, he and you need to know that all chapters of NFPA 72 2019 must be used to ensure a proper system design and installation.